This last “summer road trip” for 2018 is actually more of a “summer and fall road trip,” as we head down I-71 to Ohio’s capital city, over a few blocks to the west, and to The Ohio State University’s main campus. In particular, we’re talking Buckeye football. This season, there’s something new on offer (note — there’s a video below as well)! 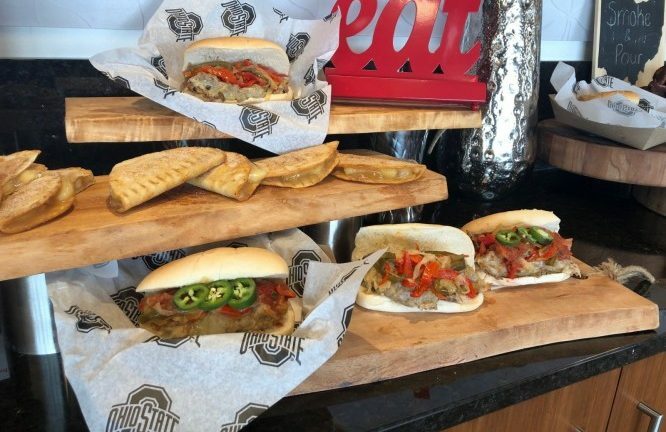 There is a new reason for Buckeye fans to get to Ohio Stadium early on game days this year: new food options that could fly off the serving tray. Levy, the food and beverage supplier to the stadium, has announced new food options for the 2018 football season. Fans of Ohio State University football will continue to see favorites like hot dogs, brats and nachos, but some of the new items on the menu are sure to satisfy fans looking for different kinds of fare. Hot dogs get a modern make-over. Along with the popular chili cheese hot dogs, fans can now choose from a French onion dog with dip and chips on top and a Reuben dog loaded with pastrami, sauerkraut, Swiss cheese and spicy Louis sauce. Cheesesteak sandwiches make a return to game day. Kurth said fans have been asking for them to come back to the stadium and their pleas have been answered. Now there is a Southwestern version with salsa and jalapeno. New sharable snacks are being offered in the student section of Ohio Stadium. Kurth said loaded waffle fries and jalapeno slices covered in cream cheese and bacon are new items. So are house-made pork rinds in a variety of flavors. “We think those are also going to go over really well in that student section,” she said. Levy is also continuing the tradition of using local vendors. Ear Goes Nothin’ stands in B and C decks will sell fresh Ohio-grown corn on the cob with butter choices of lemon herb, garlic parmesan and chipotle barbecue. Fans of the visiting team can go to the Taste of the Competition stand featuring burgers topped with flavors from the region. For example, the burger for the Tulane game will be topped with fried green tomatoes and crawfish gumbo. The beer selection is going through a shake-up, too. New beers include Great Lakes Brewing Company’s Lightkeeper Blonde Ale, Angry Orchard Rose Cider and Sol Cerveza. “We’re seeing a large growth around the Mexican beer category so we’re adding that,” Kurth said. Locally brewed offerings from Land-Grant Brewing Company, Columbus Brewing Company and Four String Brewing Company remain as well. All of these new options will be available when the Buckeyes take on Oregon State University next week. Learn more about menu options at Ohio Stadium at http://buckeyestastethetraditions.com/ for updates and information.